This new productivity-boosting product is called Report Builder. 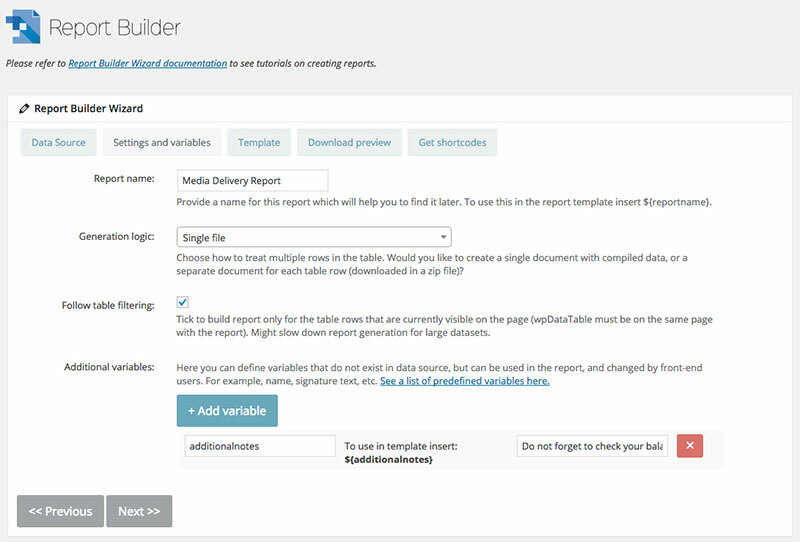 Report Builder is an add-on to the wpDataTables data manager plugin, the best data manager for WordPress on the market. Report Builder fills pre-prepared templates with real data, and instantly creates documents and spreadsheet with a single click. Looking for a Way to Automate Your WP Paperwork? Here’s Your Solution. One of the nicer features of Report Builder is that you don’t have to look for a software application to create special files in order to put it to use. This add-on readily accepts Excel or WordPress files, which means you can use your existing business forms, logo and all. All you need to do is generate the template you want to use, and have it ready when you need it. Generating a template is quick and easy. You may need to generate several to fit different types of reports, but, with a few minor exceptions, the same rules apply in each case. Nothing needs to be changed or adjusted in the Report Builder add-on itself. Wizards take care of building the different report types. In a DOCX file, variables can be placed wherever you need them in the template, while in an XLSL file, each individual variable must be placed in its own individual cell. It’s not complicated, and everything is spelled out. single report logic to produce a complete table. multiple-file report logic in which each table line generates a separate document. Once the controls have been set, they can be inserted on a page or post for future use by yourself, a client, or an end user. report not based on a table logic for a document based only on front end user input. Report Builder makes things easier by filling in the dynamic parts of the document. You can test the Report Builder here to see how it works. You can also share the templates you use with your users. Downloads can be saved to a local computer, or saved in a media library. Other options that make this add-on so versatile include downloading information via a visual editor, inserting front-end inputs, and generating and downloading multiple files or documents with one click. The doc without table source instructions in the Report Builder manual illustrates the straightforward way in which everything you need to know about this useful add-on is presented. The report-generating activities you are able to execute can also be performed by your end users if you choose. Both MS Word DOCS and MS Excel XLSX reports can be generated; DOCX with a single click, whether generated from a data table, another data source, or by a front-end user. XLSX reports can be pulled from your DB or another data source. Bulk reports are produced by generating separate wpDataTables files and downloading them in a ZIP file. 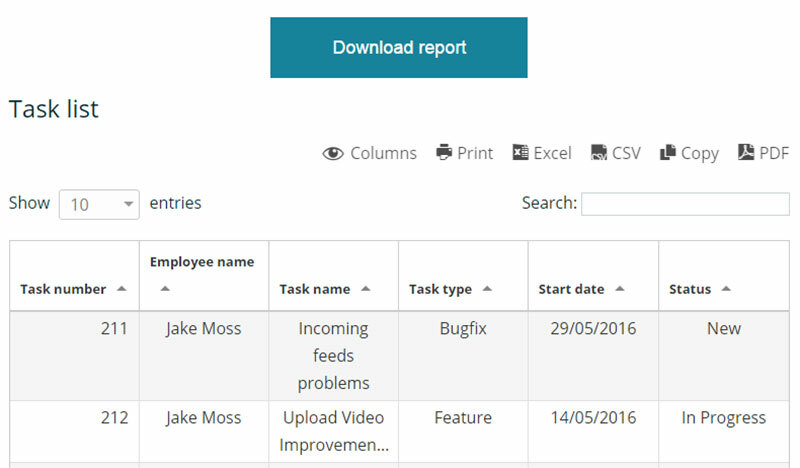 Reports can be filled in from a front-end user’s input. There is no limit on the number of front-end inputs. Once a report has been prepared, it can easily be inserted onto a page using Visual Composer or the WP Visual Editor. Prior experience in using wpDataTables is helpful, but there is no appreciable learning curve involved in using Report Builder. One pass through the user manual should suffice. All of Report Builder’s features are explained in detail in the online documentation, and you also have access to a library of usage examples. Free lifetime updates come with your purchase of Report Builder, and you will also receive 6-months’ worth of free support. Report Builder makes time-consuming data reporting via paperwork a thing of the past, and it does so right out of the box. This time-saving, productivity booster will make life a lot easier for you and your end users alike. With this latest add-on, the wpDataTables plugin gives you a truly impressive data management and reporting tool to work with. wpDataTables continues to be improved upon in other ways as well. One of the more significant improvements is the addition of a responsive charts capability. This feature ensures your data is always readily available to mobile users, and will be accurately and reliably displayed on their tablets and mobile devices. The ability to manage huge amounts of data. Impressive computational power, advanced search and filtering techniques, and a conditional formatting capability that end users will find extremely useful. The capability to provide real time data in tables generated directly from MySQL. wpDataTables can be used with any WordPress theme, it requires no coding to use, and it can create a responsive table in WordPress in a matter of minutes.